Do you suffer from neck and shoulder pain? Multireflexology – Dien Chan (facial reflexology) is a natural therapeutic technique practiced in short sessions that can provide immediate and long term relief from pain and tension throughout the entire body. It has a wide field of application and offer excellent results in the treatment of migraines, digestive and circulatory systems, etc. In this video Michele Mork of West Coast Reflexology demonstrates how to use Dien Chan multireflexology Tool #252 (the Beauty Brush) to relieve neck and shoulder tension. The tool works most effectively when you use the yang or brush end of the tool in a circular motion to stimulate the areas along the nose, eyebrows and temple, then use the yin or roller end of the tool to roll or cool and release the same areas. 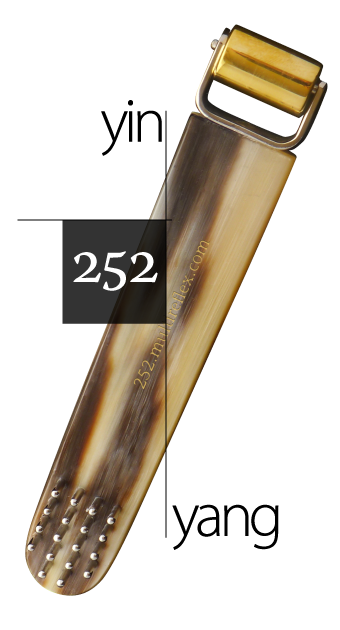 To place your order for your own personal Dien Chan Beauty Brush (no 252, $48) email: info@westcoastreflexology.com. This entry was posted in Multireflexology Dien Chan, Reflexology Tips on December 4, 2018 by Michele Mork.